We identify with pilgrims — reckless religious journeymen risking everything to find fulfillment in undiscovered countries. We’ve met more than a few pilgrims on our beer adventures — wild-eyed warriors ready to redefine the spirit of beer. We certainly don’t claim to know anything about history or spirituality, but the American folklore of pilgrims can actually be traced back to our love of discovery, freedom and beer. Thanksgiving was, in fact, America’s first beer run. This might be a mind-blowing revelation, but the pilgrims were supposedly forced to land on Plymouth Rock because they were low on beer (the beverage being a not-very-alcoholic concoction drunk in impressive quantities during the Colonial era). Like all great things, Thanksgiving has a rich history soaked in beer, and every year we love to translate that tradition into encouraging and educating our readership about homebrewing. In honor of thanks and giving, we reached out to a few of our favorite brewing professionals around the country to get their advice on the ultimate Thanksgiving treat — homebrewed beer. 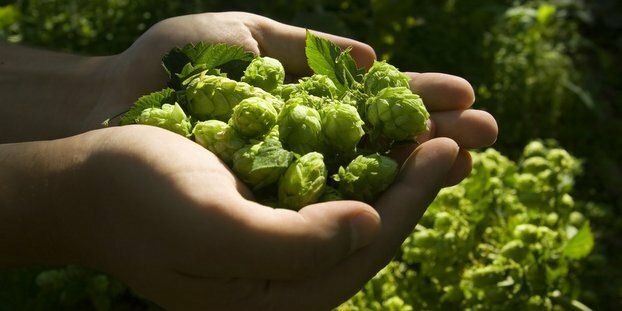 From California to Delaware, craft breweries from Dogfish Head to Founders and beer professionals from Homebrew Supply to Oregon Fruit Products responded with excellent insights for homebrewers everywhere. We thank them all for taking time out of their busy holiday schedules to participate, and we wish everyone in the craft brewing world a happy and safe Thanksgiving holiday. Beer, like most good things in life, requires a pretty simple recipe. As homebrewers advance in the hobby, they eventually start to experiment with creating their own recipes. Creativity and customizing beer to one’s personal tastes is really what this hobby is all about, and that is a beautiful thing. A very important lesson in creating new recipes is that complexity of character does not require a complex list of ingredients. As a beer judge, I frequently come across what I call “kitchen sink” beers — beers in which the brewer threw in every ingredient, including the kitchen sink, aiming to develop complex character. More often than not, kitchen sink beers end up tasting muddled rather than complex. If you were cooking a gourmet meal at home, you wouldn’t throw in every spice in the rack and expect it to taste good, would you? Don’t do that with your beers. My advice to those new to recipe formulation is to get to know your ingredients. You can start by tasting different grains at the homebrew shop or making hop teas to get some sense of the flavors and aromas. That only goes so far because beer flavors are more about the interaction of ingredients that have been brewed together and put through the fermentation process. You can really start to learn the flavors of ingredients by limiting your recipes to just a few variables, like a base malt plus one specialty malt and one variety of finishing hop. Taking that to the extreme, you can do SMaSH beers — beers with a single malt and single hop — but those really can be boring. If you already have a favorite pale ale recipe and know the malt character pretty well, you can then experiment with using a different finishing hop to see how that hop variety compares with a previous batch. By keeping it simple, you can learn to create something complex. Let me introduce you to the flavor chemist called Mother Nature. Fearlessly explore the landscape of ingredients available to you. Beer is your canvas, your creation. Don’t be constrained by what others say it must or must not be. “Goodness” will always trump “style.” Being fearless does not mean you have to be foolhardy. Experiment with ingredients before you brew with them. Let’s be honest, brewing a beer requires a considerable investment of your time and effort. It’s easy to say, “Well, it’s only 5 gallons,” but who wants to spend their time making any quantity of bad tasting beer? Start smaller and play with each ingredient a bit. Use a tea strainer or cheesecloth to make a concentrated tea with a potential ingredient and then add some of the tea to a commercial beer to see how the flavors work. Alternatively, you can steep the ingredient directly in a small amount of beer. This will open up a whole world of possible ingredients to try and allow you to separate the winners from the duds before you brew. When it comes to the quality of your ingredients, don’t make compromises. Use the freshest and highest quality, natural ingredients available. There is no better flavor chemist than Mother Nature. Taste and smell them before you use them because most aromas and flavors you detect will end up in your beer. Once you obtain your ingredients, use them quickly or store them properly. Treat them like food because they are, after all, food. Above all, have fun. Avoid turning your hobby into a chore. Keep it simple. Learn from your failed batches and keep exploring. Control the single-celled microorganisms making your homebrew. Yeast is the workhorse of every brewery. Even the highest-quality wort would be nothing without healthy yeast so here are a few elements to consider to make the best of your weekend brew day. Oxygen — If you haven’t already, invest in the equipment to add pure oxygen to your wort. Oxygen influences yeast growth, and aeration by shaking is unlikely to achieve an adequate amount of dissolved wort oxygen. Make a Starter — The four-week-old smack pack from your homebrew shop probably isn’t in the best of health, and a starter can increase the cell density of the slurry and restart metabolic processes necessary for fermentation. Pitch Rates — One of the most critical control points of fermentation is pitch rate. Pitch rates drive yeast growth and flavor development. Instead of counting cells, I would recommend homebrewers develop a consistent pitching regimen that produces quality fermentations. Patience — All brewer’s yeast will produce diacetyl. Healthy yeast will metabolize this excess diacetyl during the end of fermentation so long as they are kept at optimal temperatures. So many times beers get rushed into cold conditioning before the yeast has had a chance to reduce diacetyl. An extra day or two for ales and an extra week for lagers can make all the difference. This is the home where I brew. One of the greatest issues I had seen in my earlier brew days was waste. To be more specific, I noticed my water waste. I had never been a large proponent of conservation in the past, but as time went on it began to bother me. After a little bit of research I quickly noticed there was an obvious simple fix: Rainwater was the answer. With an average roof collecting 600 gallons of water for every inch of rainfall I had enough water for an entire year with even a small storm. Never having collected or used rainwater before, there was still little to no learning curve. The entire system cost me under $200 and was installed in a just a few hours. Here are some good DIY builds. At first, I just wanted to use this water for chilling my wort, sanitizing and cleaning. This portion of the brew day was where the vast majority of my water waste was generated. When I dug a little deeper into using this open resource, I decided to actually brew with the rainwater as well. It seems odd to do because the water is essentially stripped of its properties, but I figured I would try it. Little did I know this would be the reason I would learn water chemistry, and boy am I thankful. I did have concern about the sanitation of the water, so I opted to run it through a reverse osmosis system before building my profile — this may cost another $200 or so. But the money saved, the knowledge gained and the dropped sense of guilt from wasting so much water has been worth every penny and second spent toward this project. I hope y’all enjoy it as well! Did the Pilgrims stop on Page 1? No. Click Next Page for tips on yeast pitching, fruit flavors and more. Sandra Savcic Morgan liked this on Facebook. Sandi Morgan liked this on Facebook. Regnier Insurance for Wineries & Breweries liked this on Facebook.